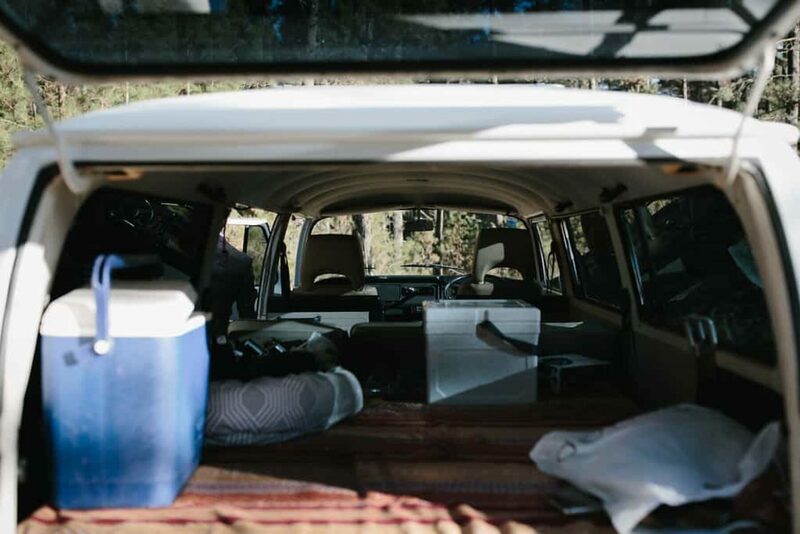 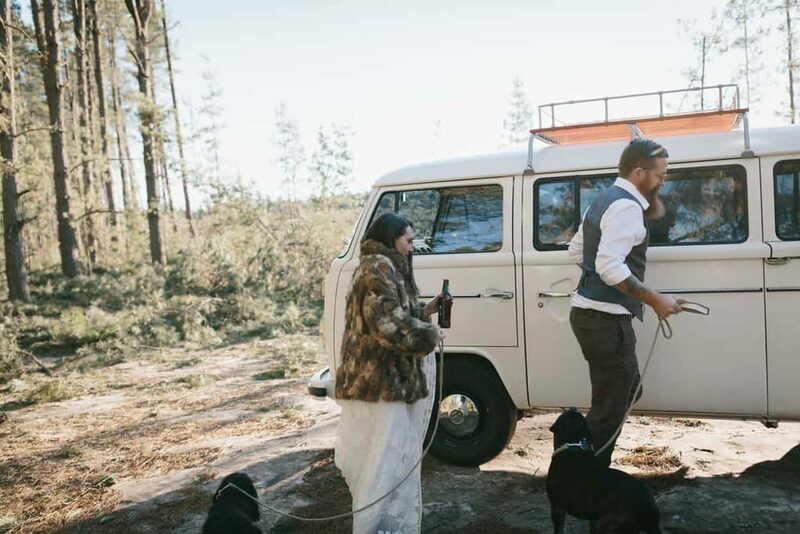 In lieu of a huge wedding, Rachel and Eli opted to buy a VW Combi Van and simply elope. 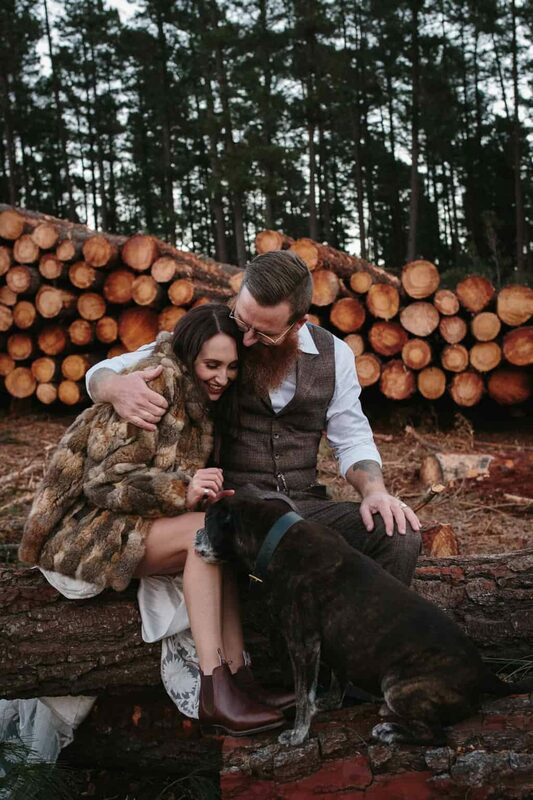 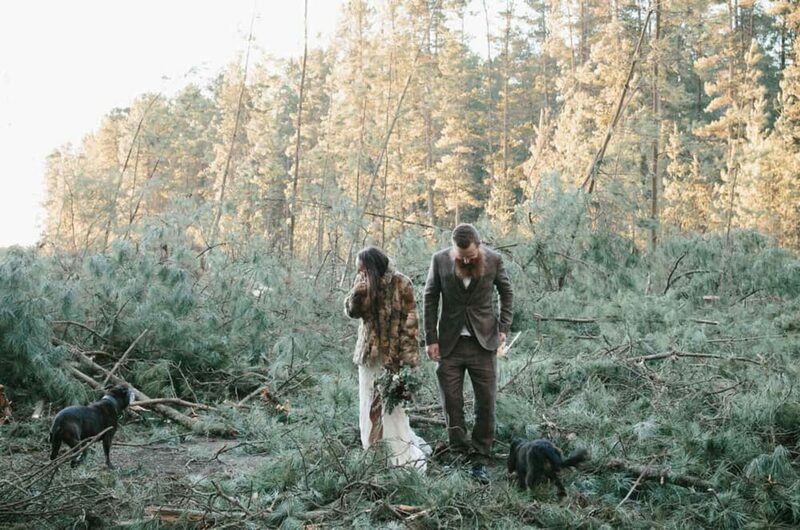 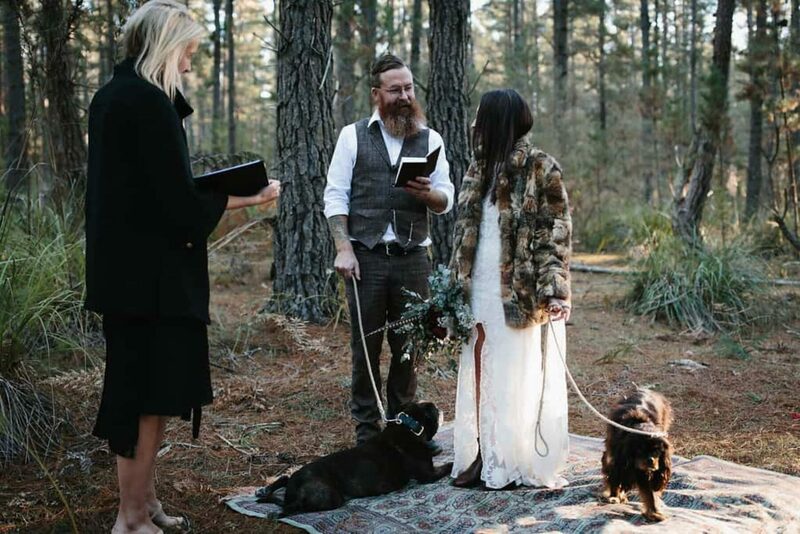 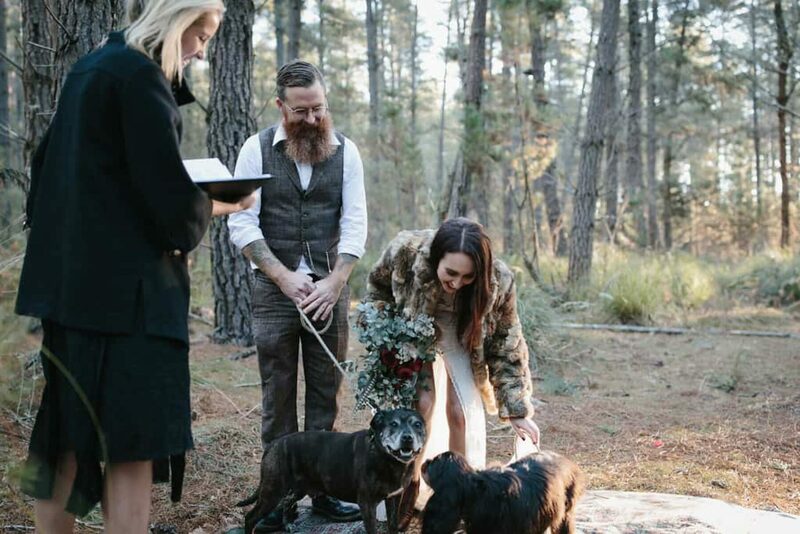 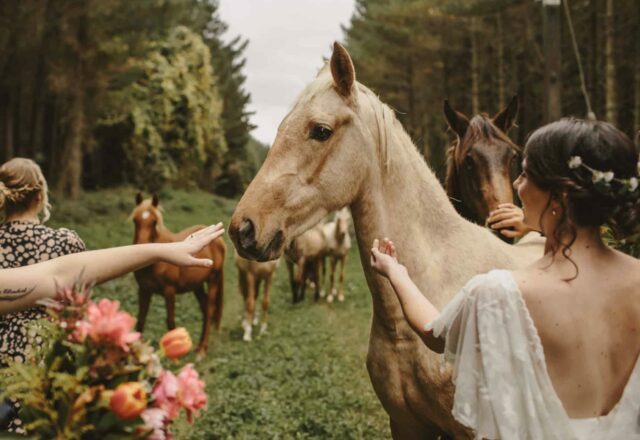 With photographer Jimmy Raper and videographer Kurt of The Barefoot Bride along for the adventure, the pair road-tripped to Penrose State Forest, where they swapped vows in a clearing, with their two dogs as witness! 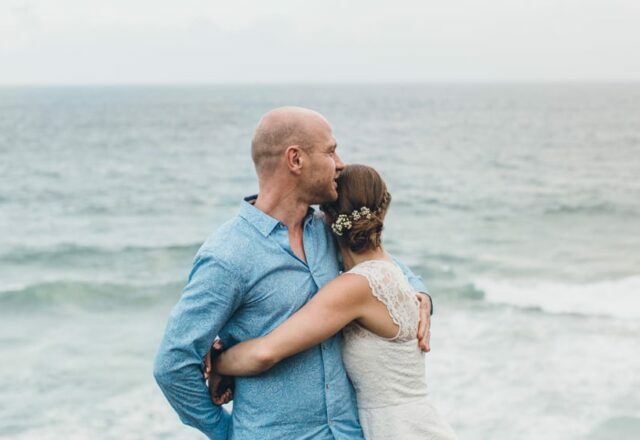 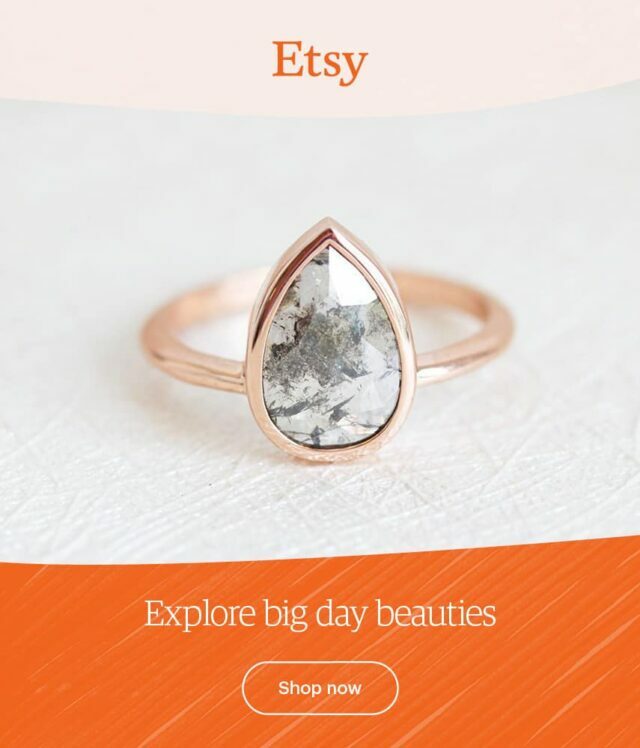 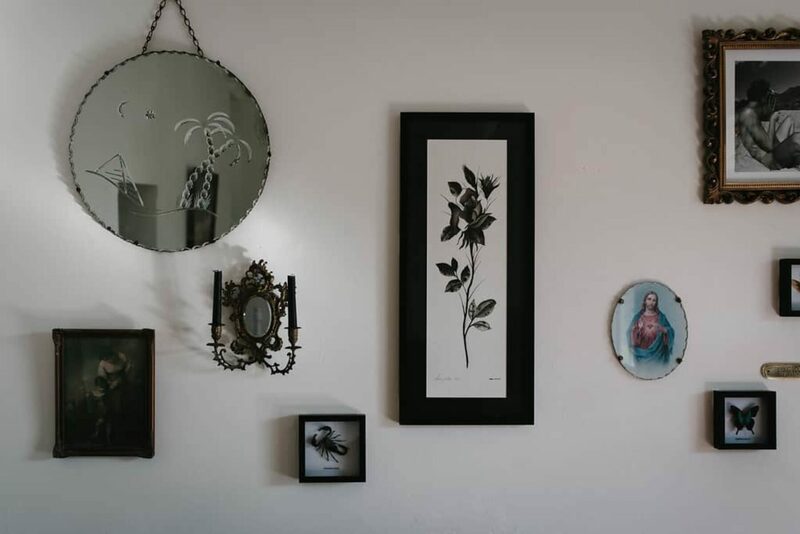 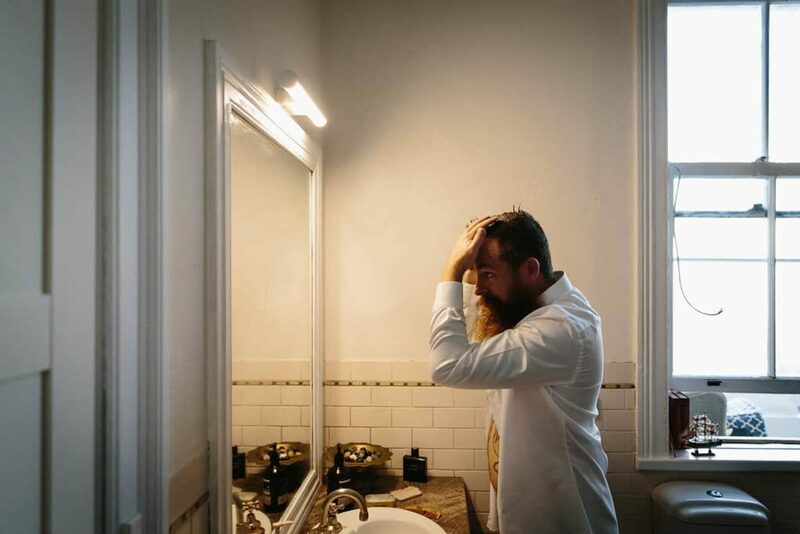 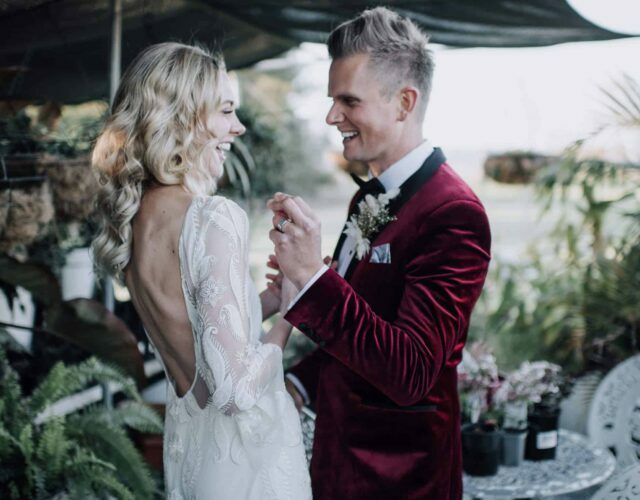 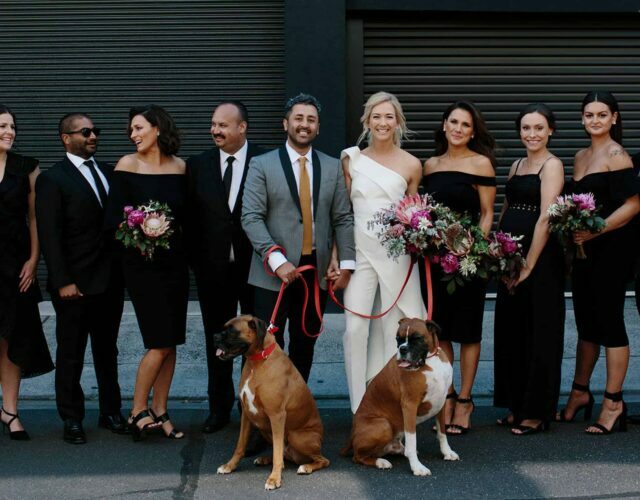 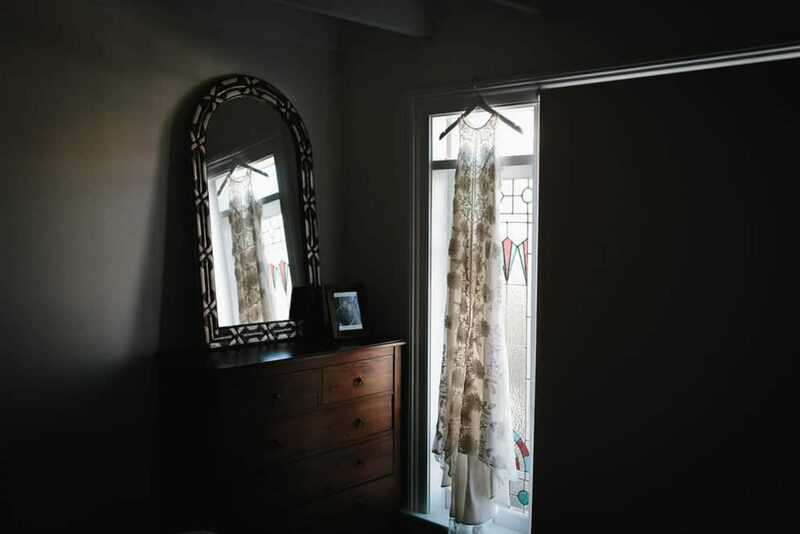 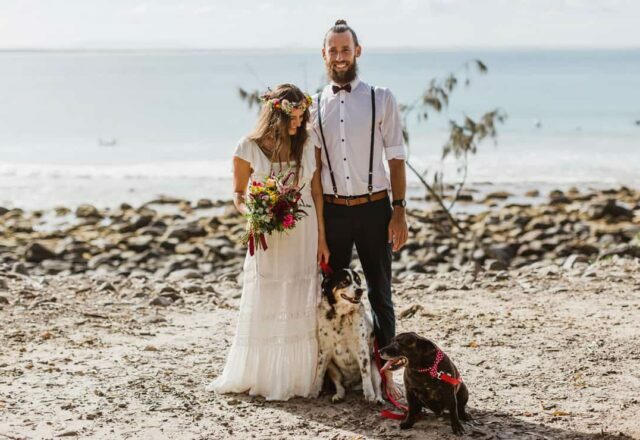 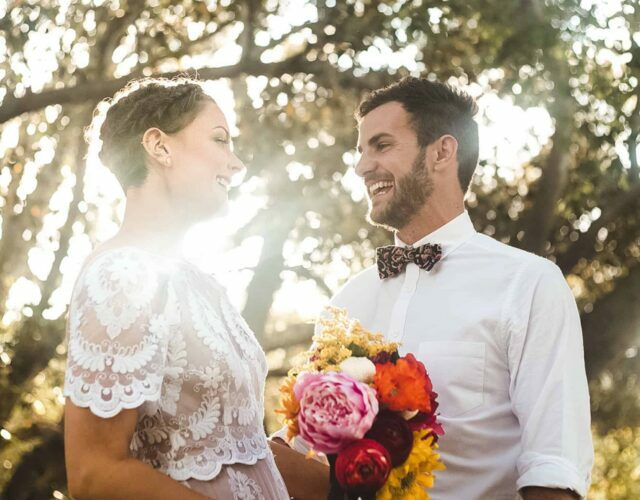 After meeting through mutual friends, Rachel and Eli went their separate ways – Rachel was based in Sydney at the time and Eli in Byron Bay, but when Eli relocated to the city, he chased her up and persisted until she agreed to a date. 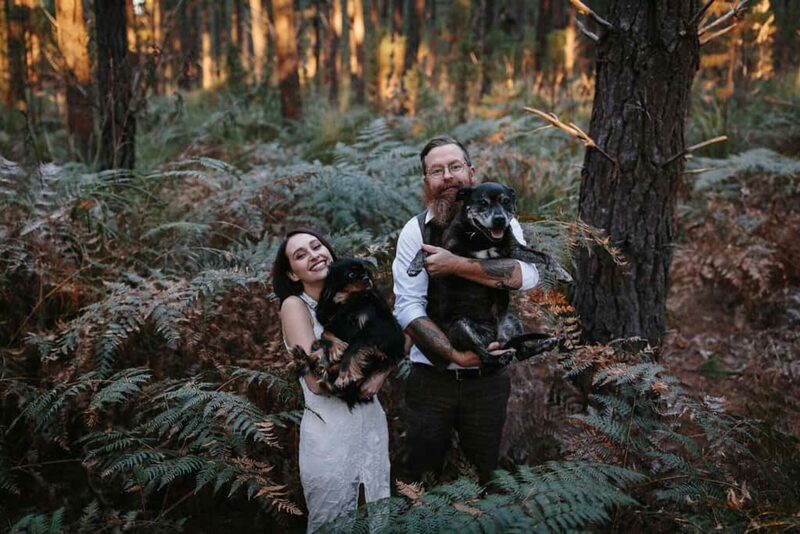 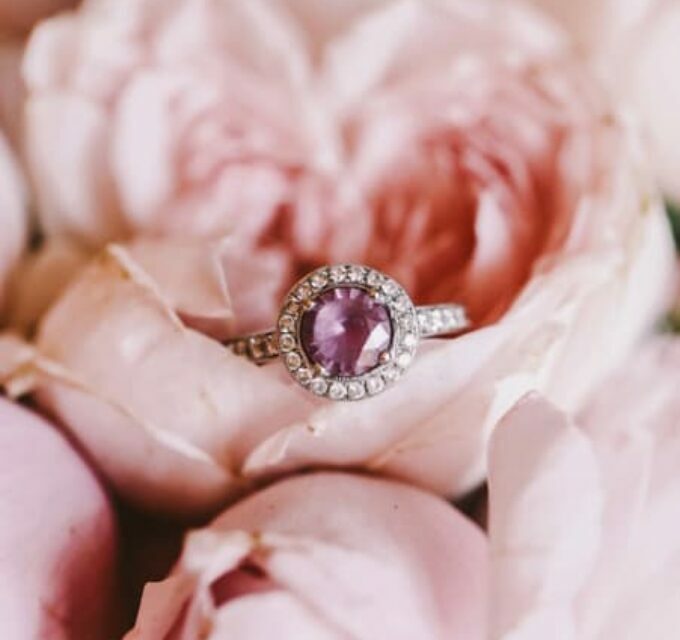 He’d planned to propose during a trip to Belgium, but couldn’t wait so instead he popped the question on the spur of the moment while walking their dogs near the harbour and the rest is history! 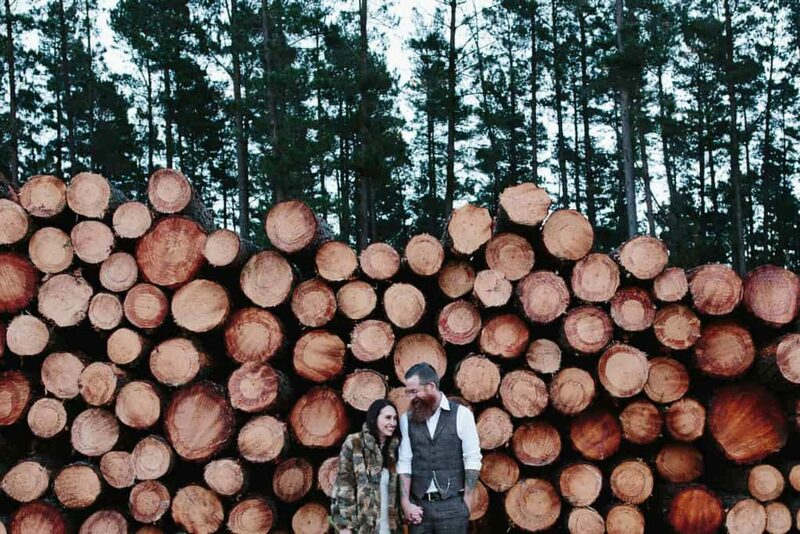 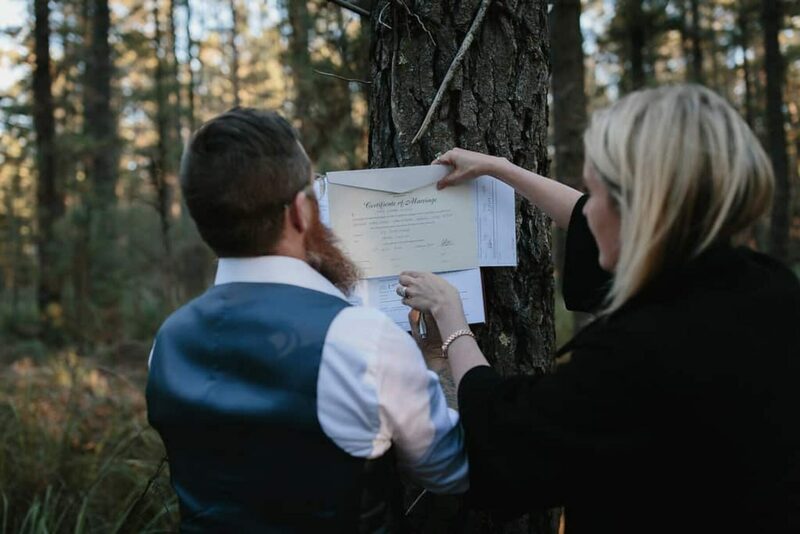 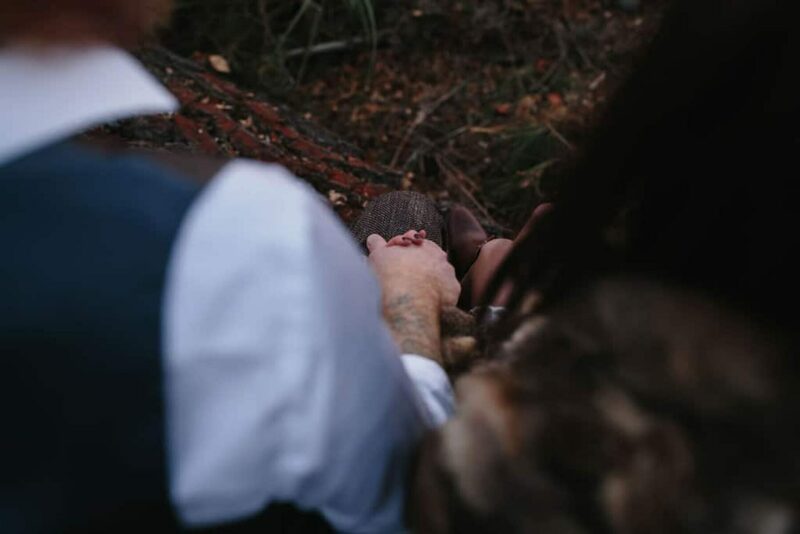 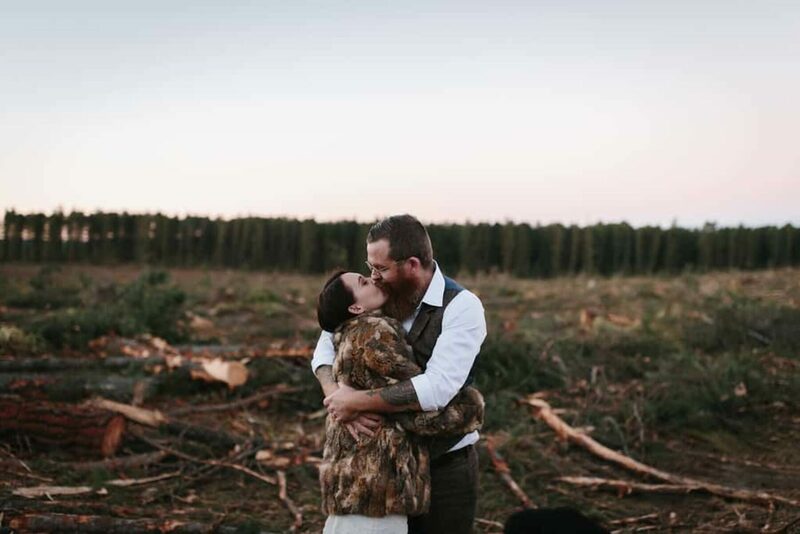 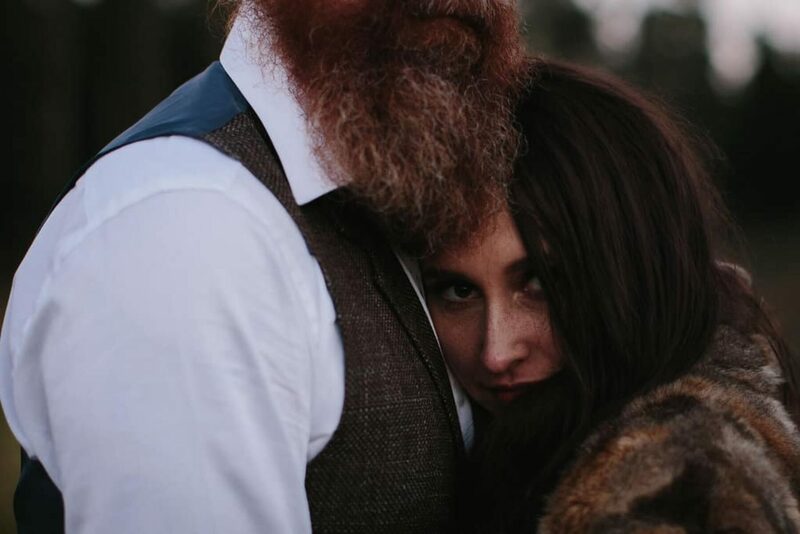 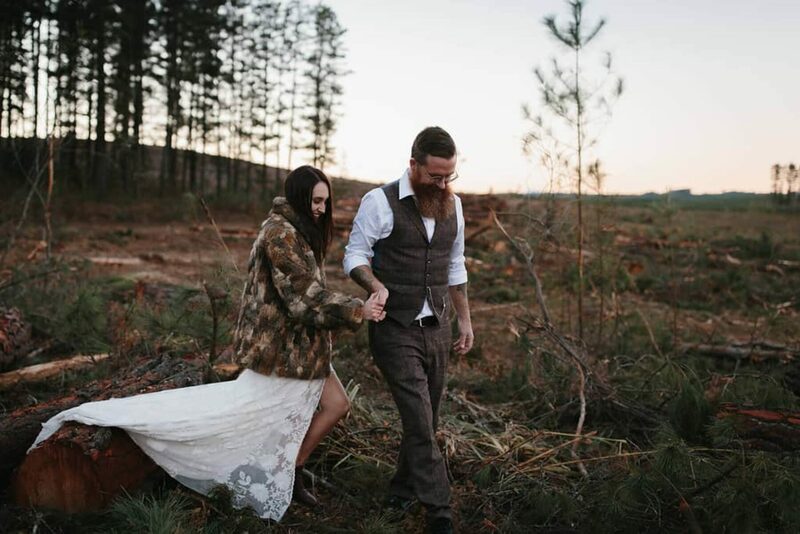 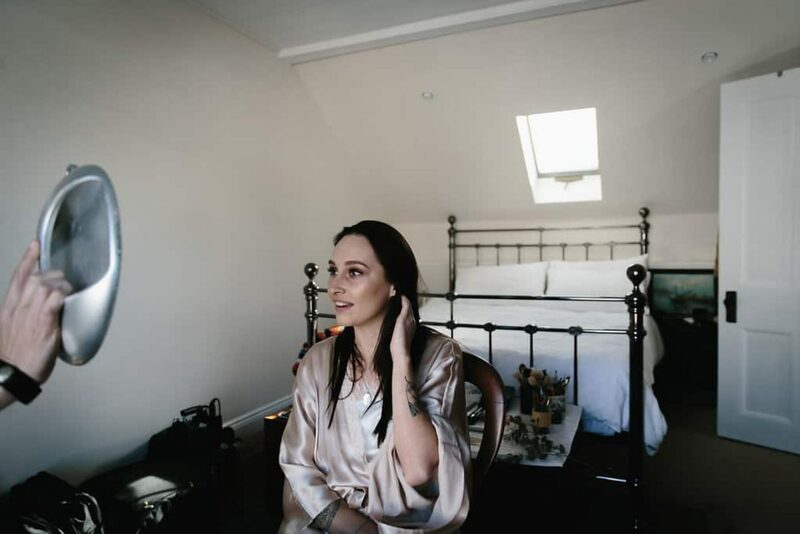 Being an elopement, the couple didn’t plan a theme but we’re loving the retro vibe of their old school attire and the grainy vintage footage captured by The Barefoot Bride. 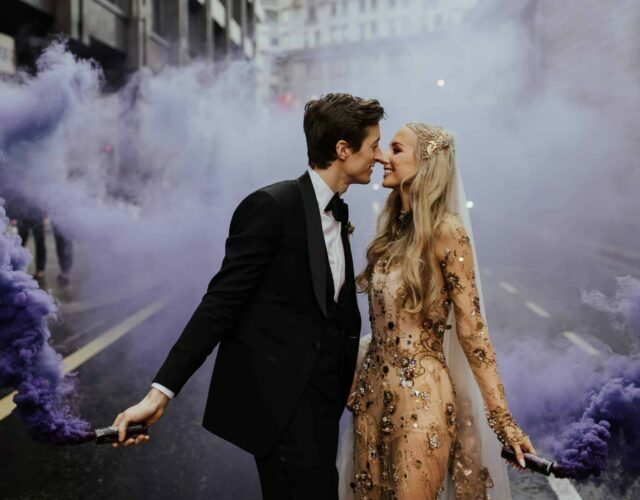 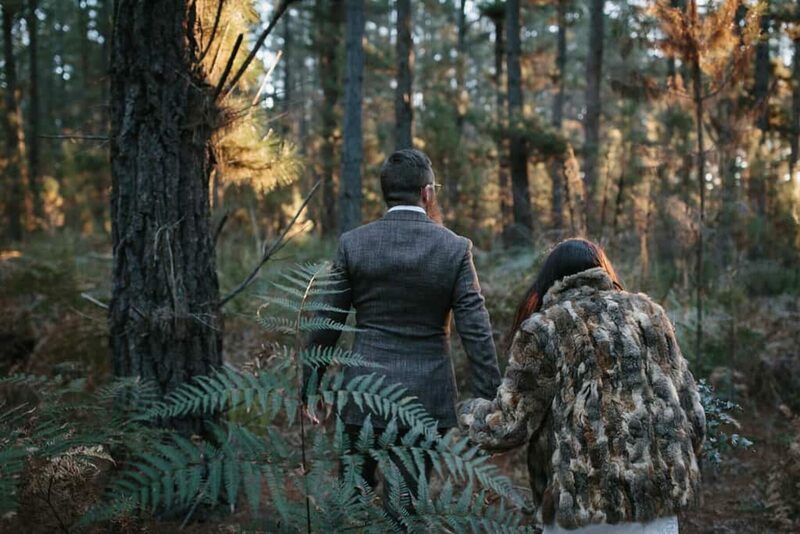 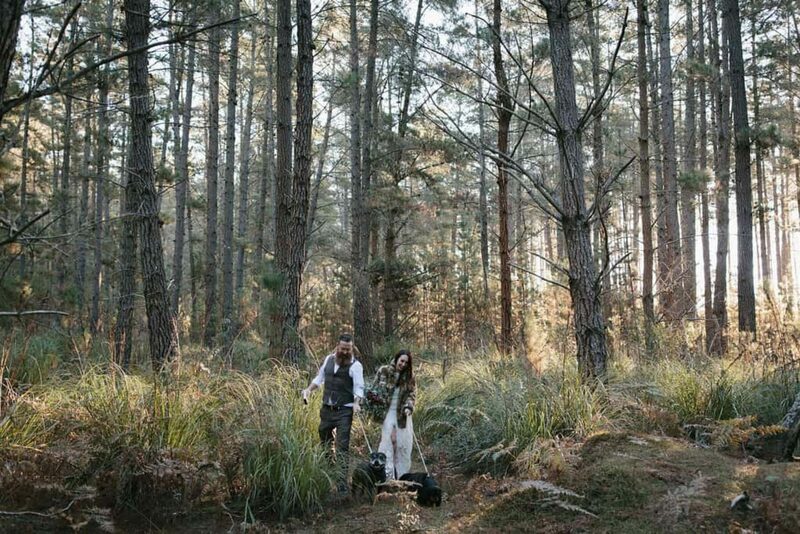 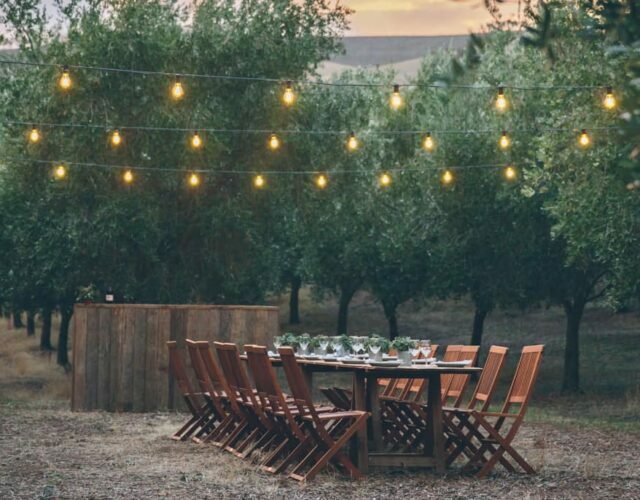 Post-wedding, the pair headed home for some slow-cooked lamb shanks and champers in the spa and we have a feeling there will be plenty more of these little adventures to come. 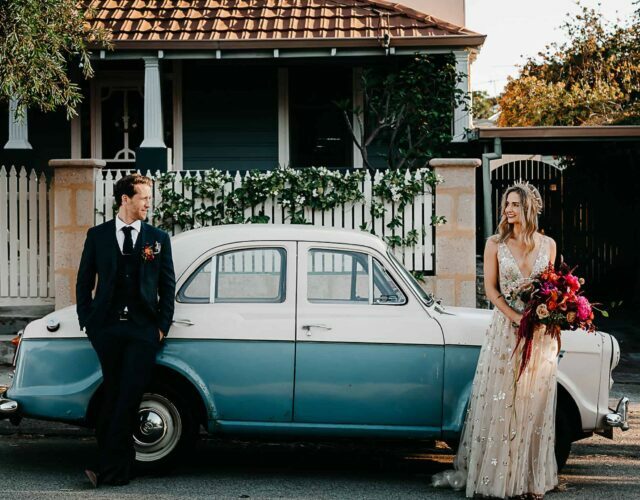 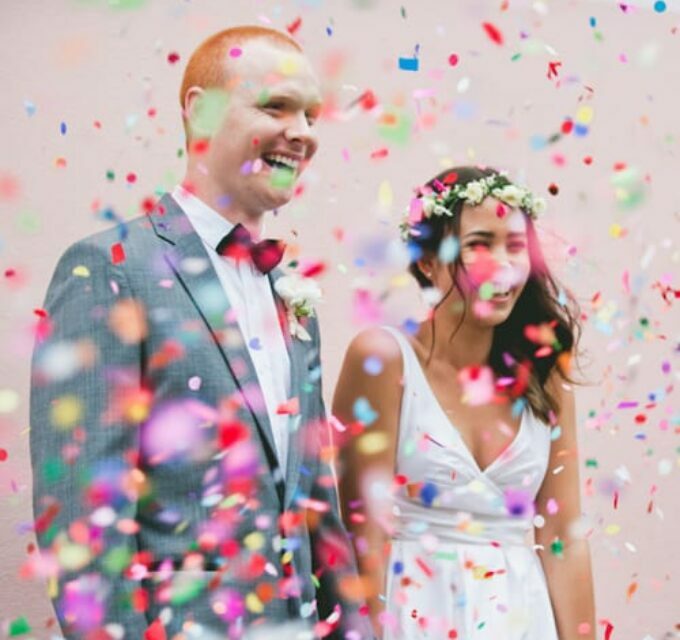 You know what they say – expensive weddings last but a day, Combi Vans are forever. 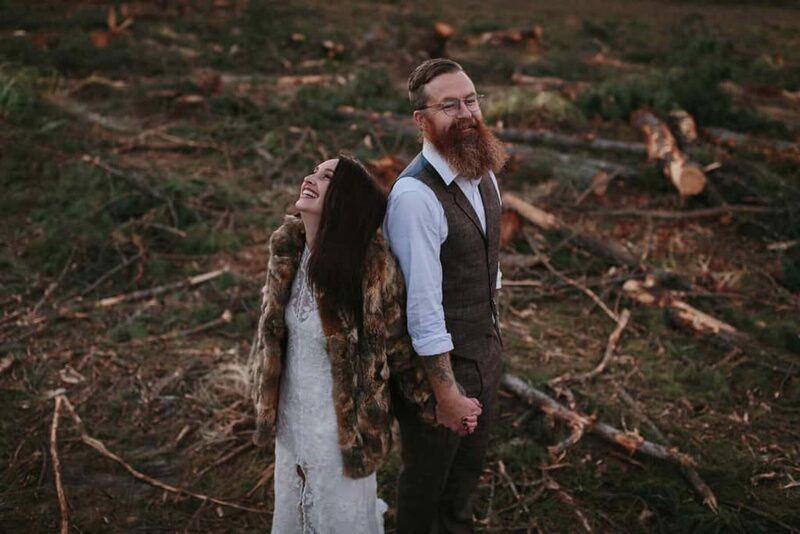 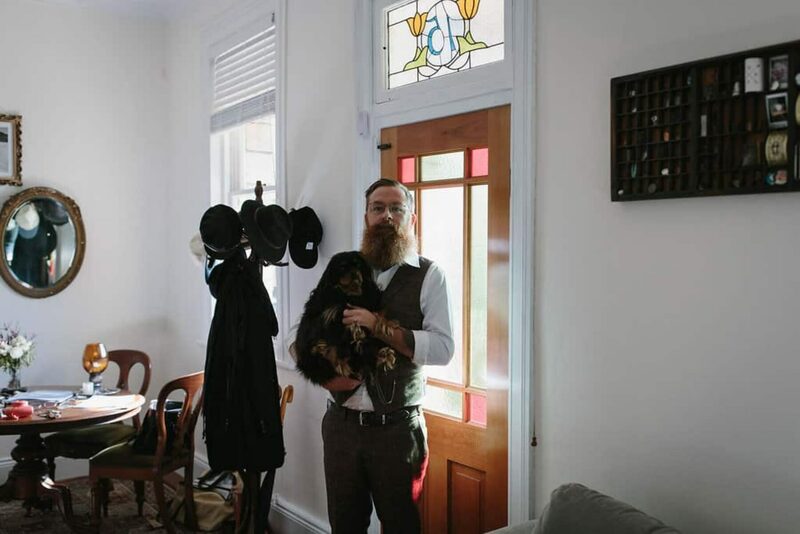 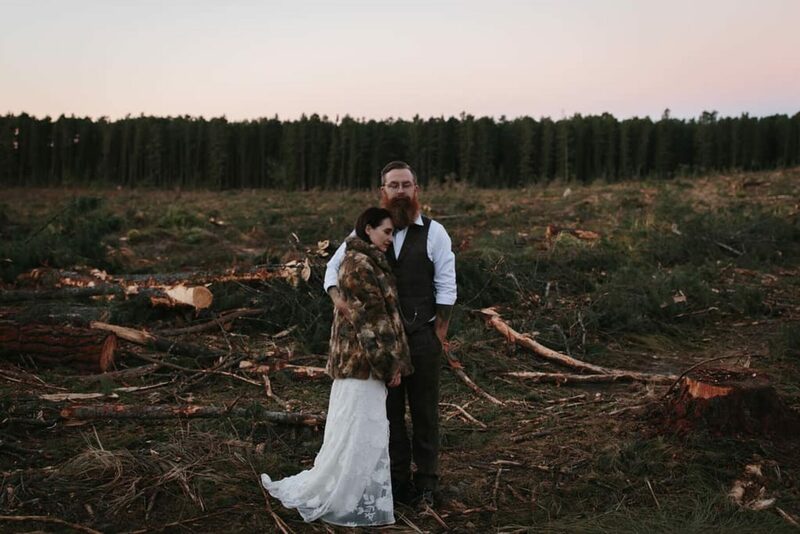 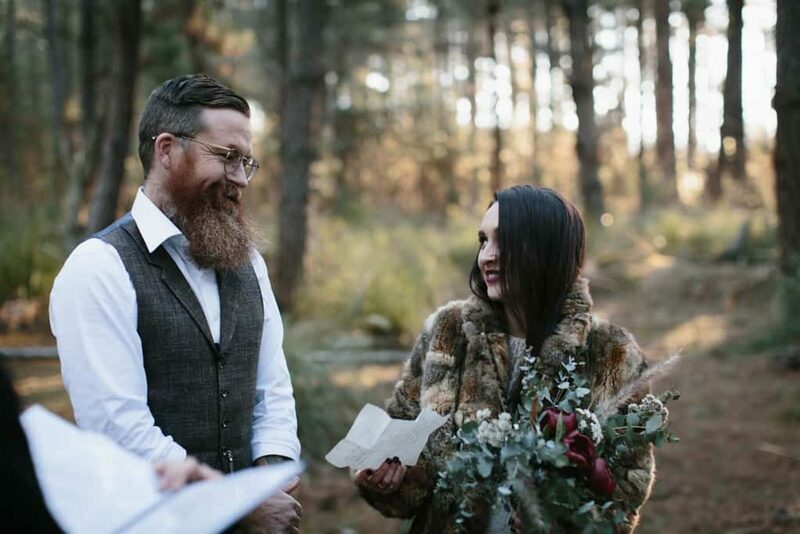 Ever the stylish groom, the bearded and bespectacled Eli rocked a tweed suit and waistcoat by Suit Supply, complete with antique pocket watch. 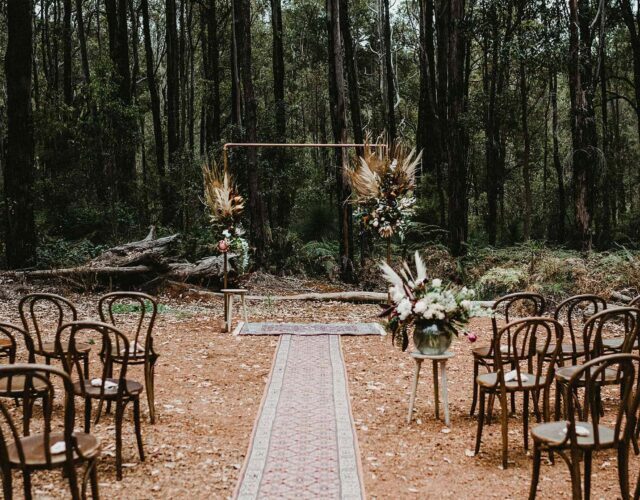 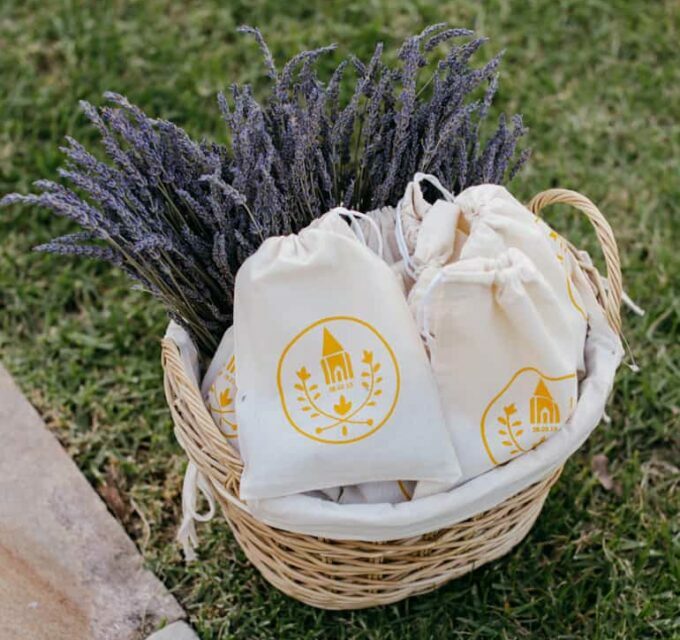 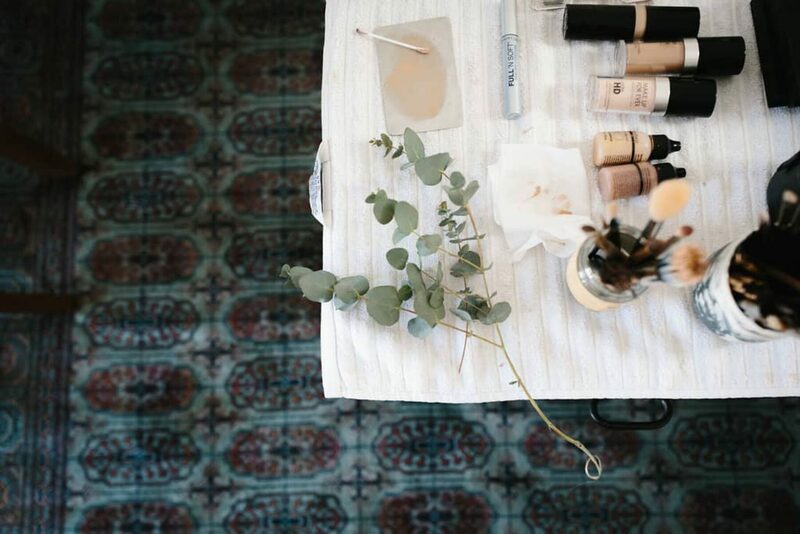 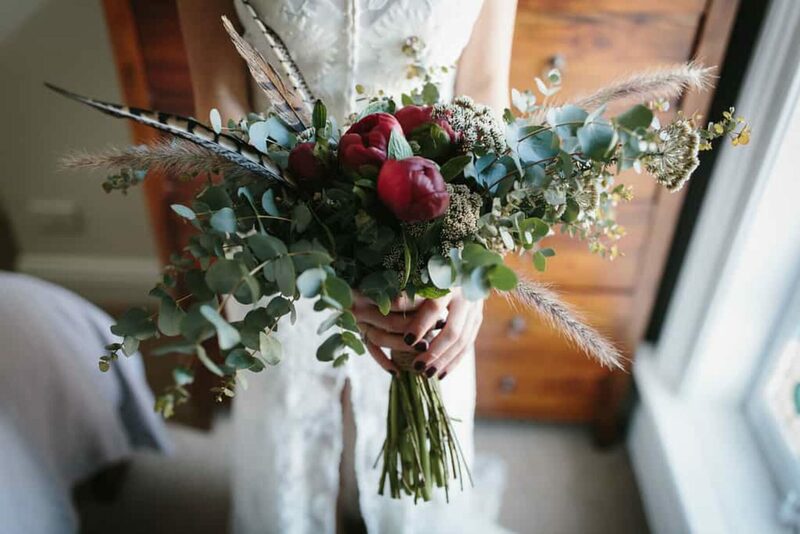 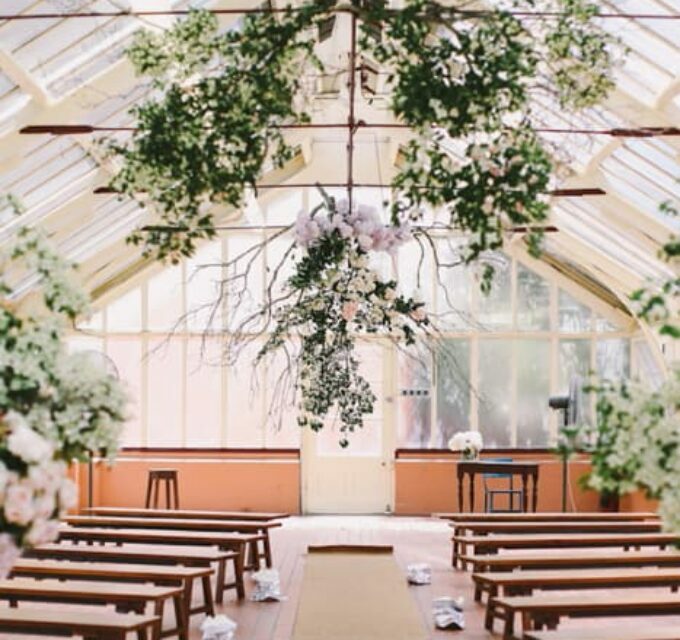 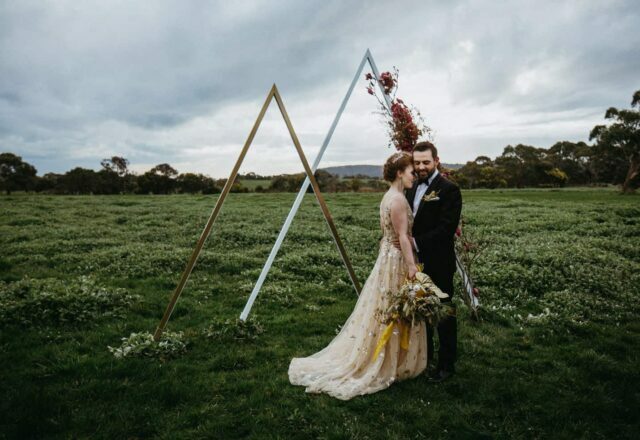 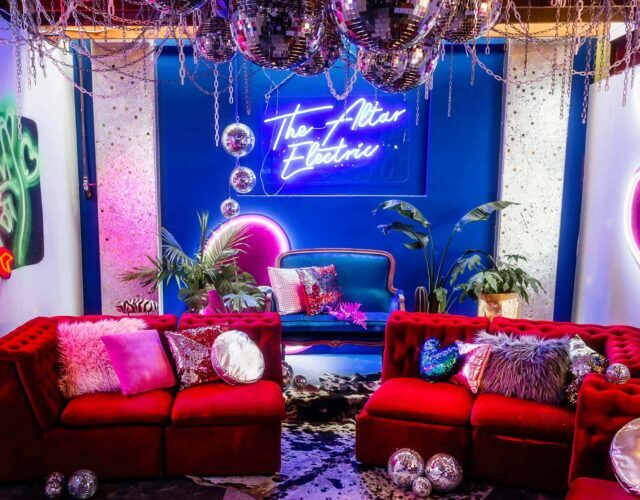 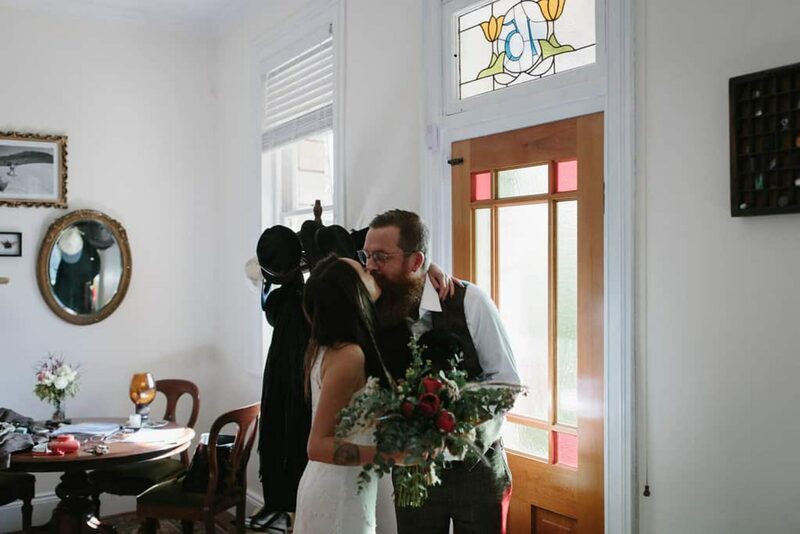 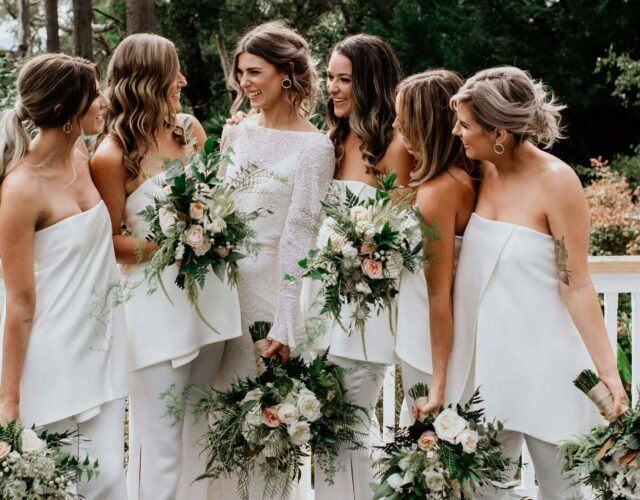 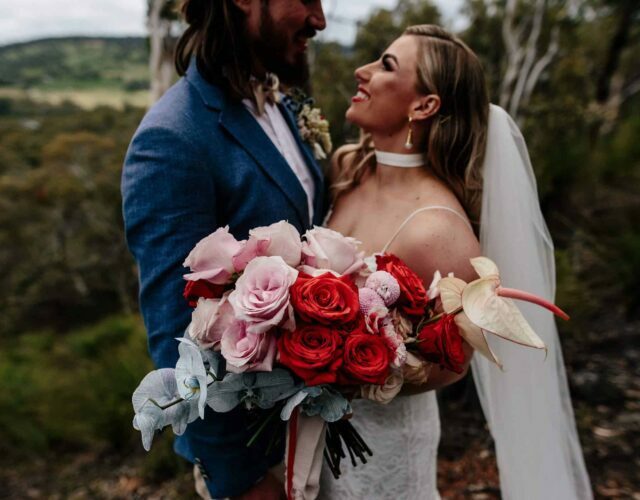 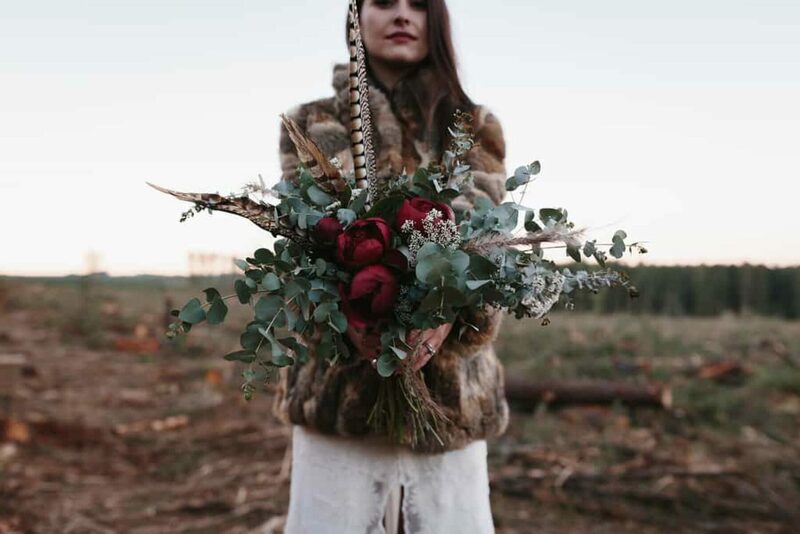 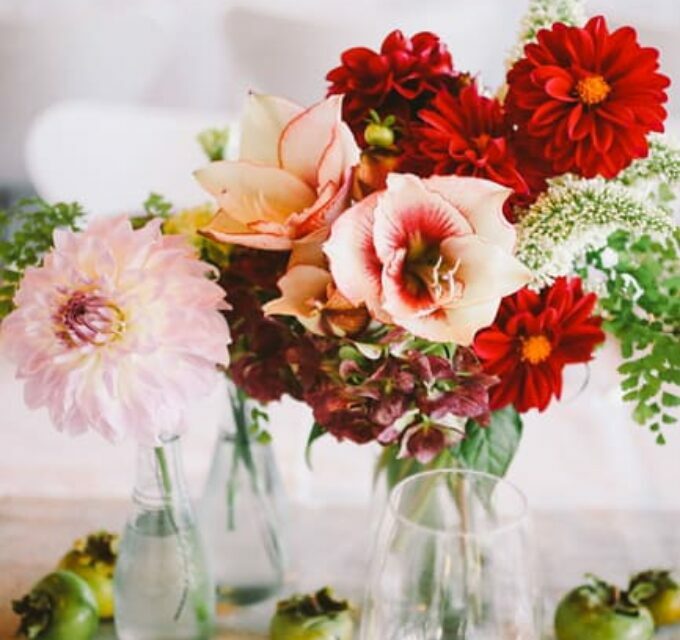 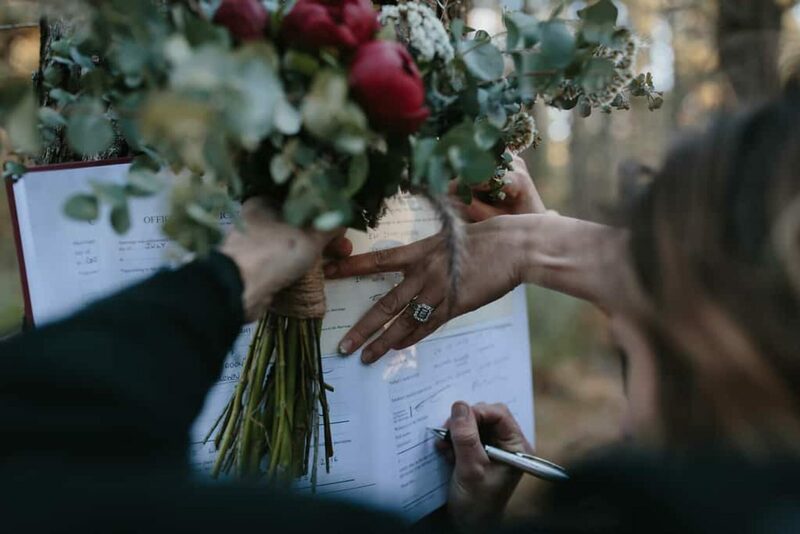 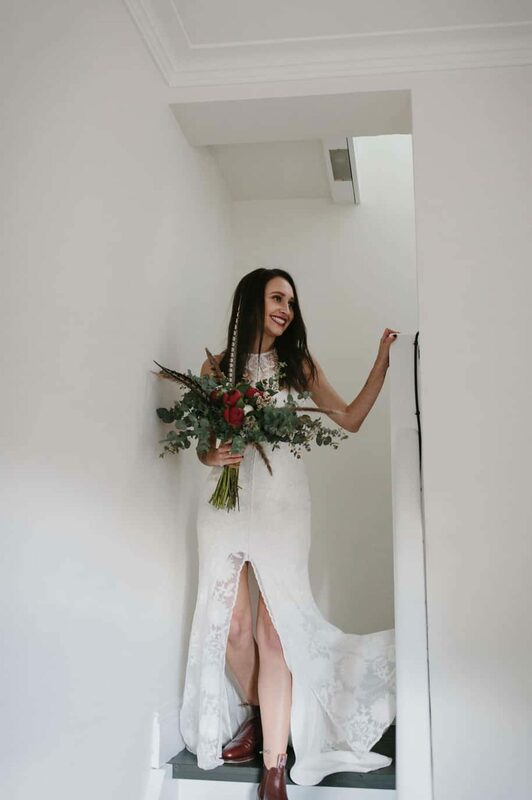 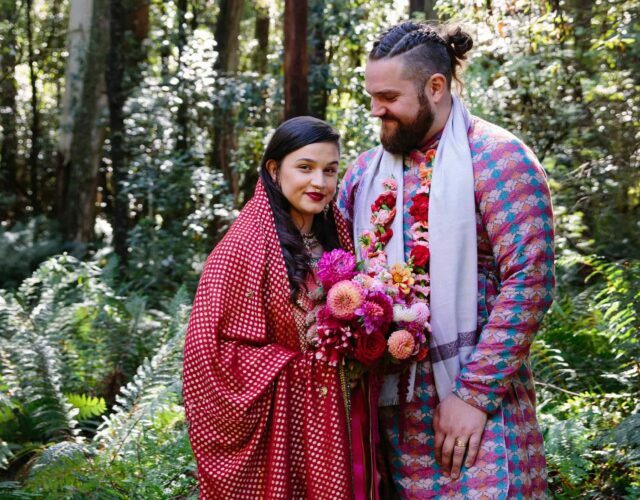 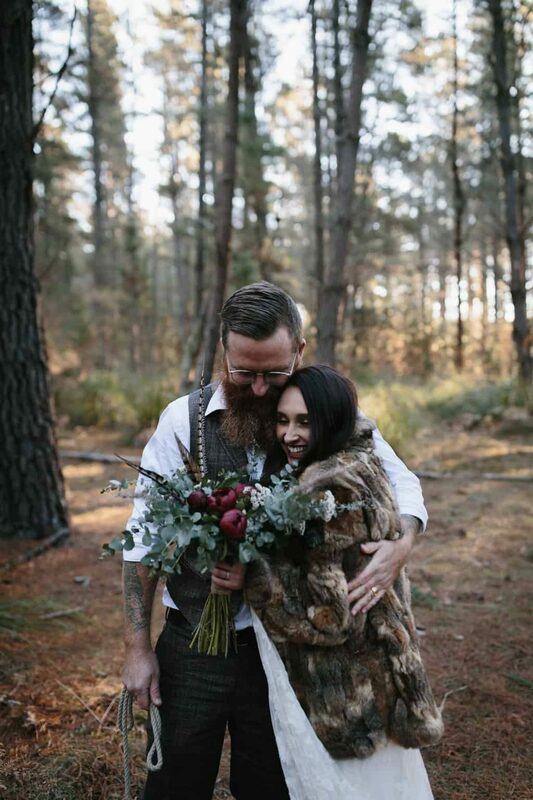 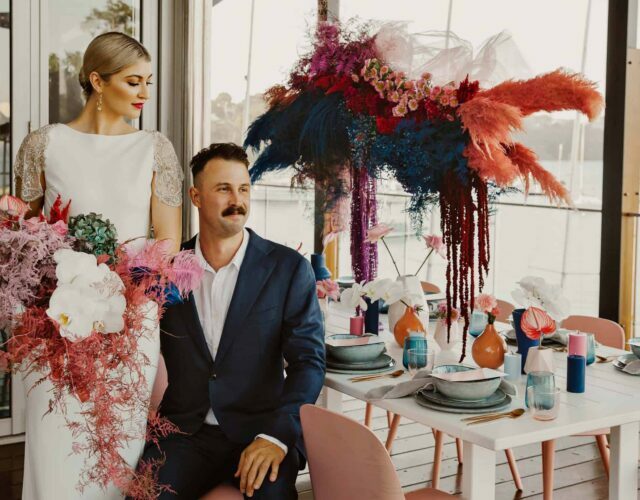 After initially struggling to source the eclectic flower and feather arrangement she had in mind for her bouquet, Rachel finally found Millie of Bloodwood Botanica, who created exactly what the bride had imagined. 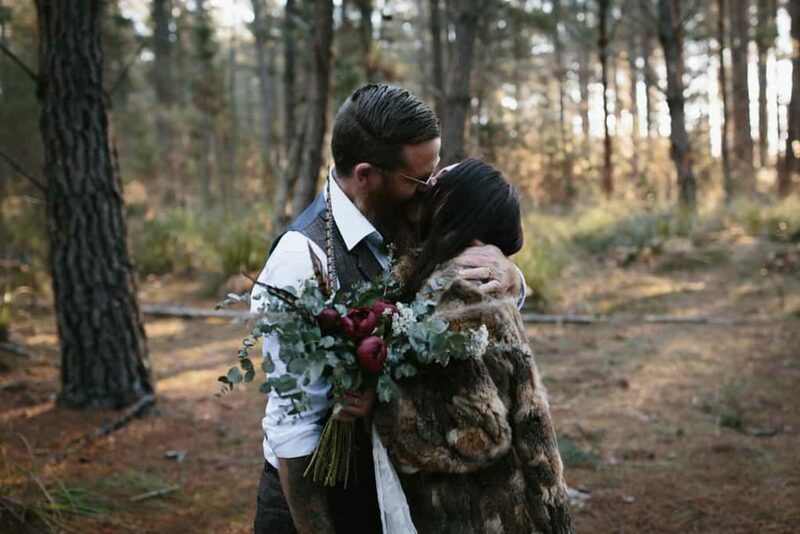 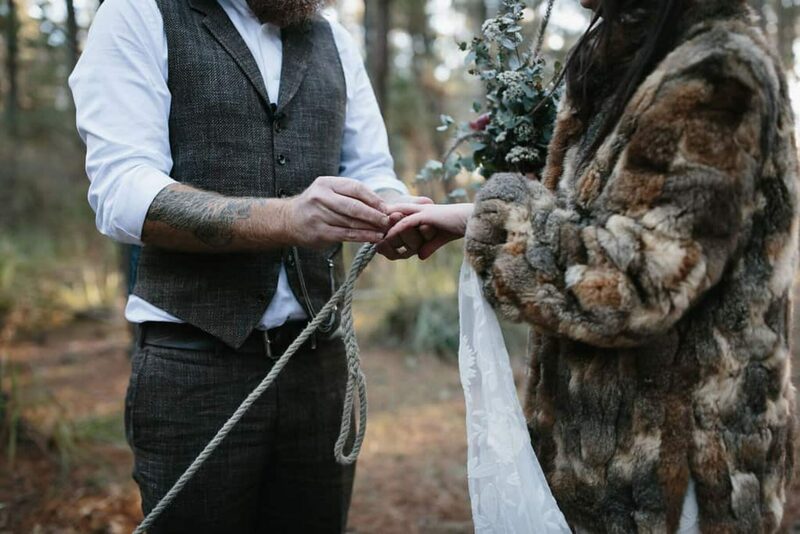 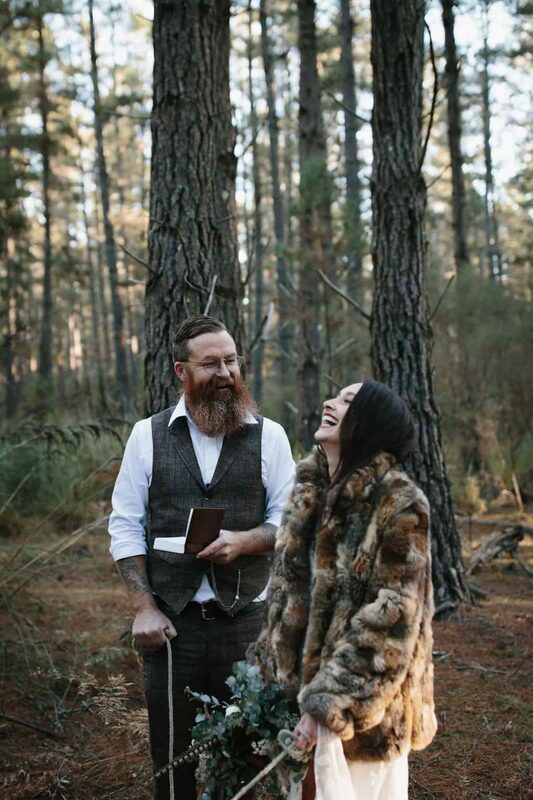 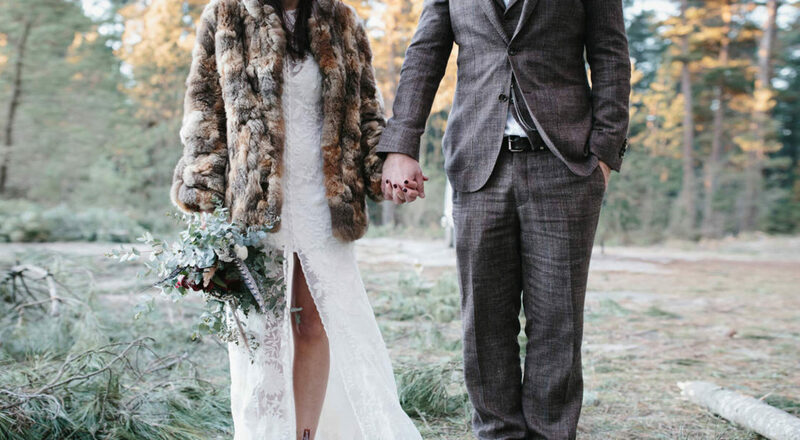 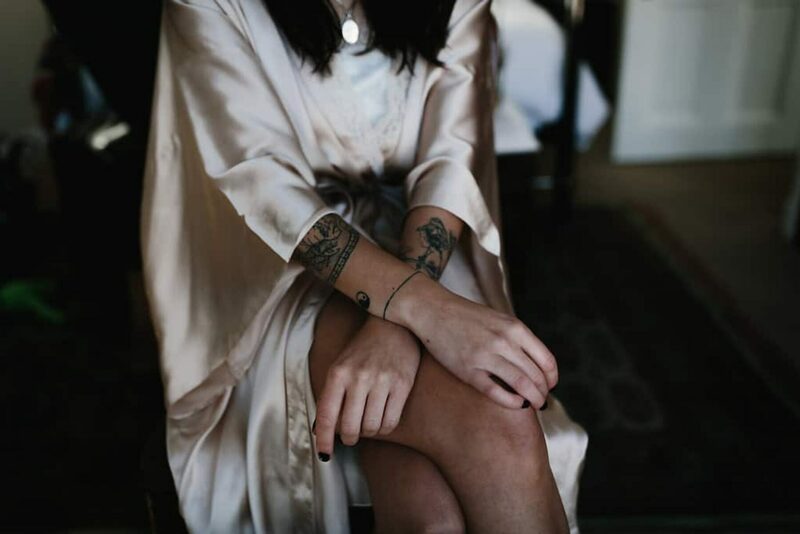 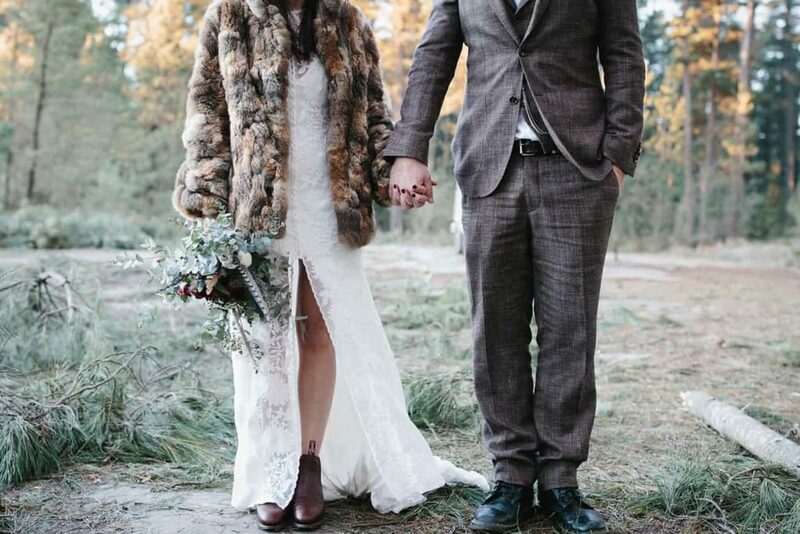 In her gorge Rue de Seine gown and later joined by a vintage fur (sourced at a car boot sale) Rachel was every bit the boho bride. 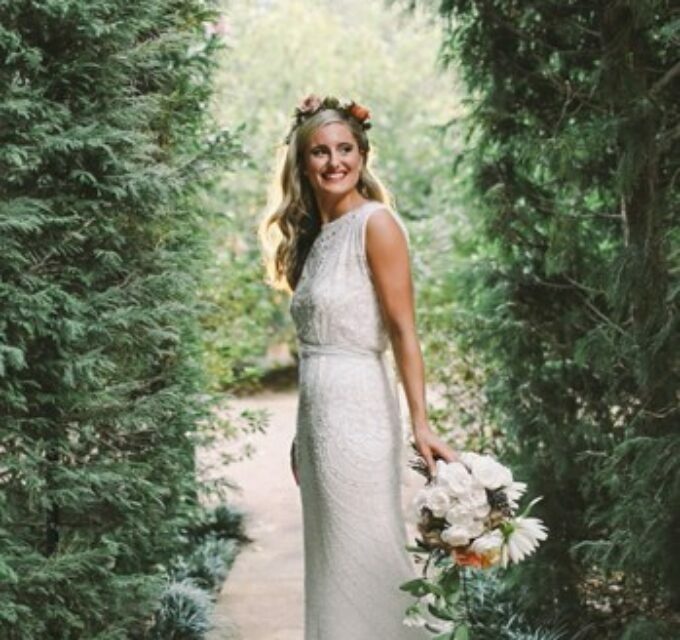 Tanya of Chic Artistry worked some romantic makeup magic and a pair of tan R.M. 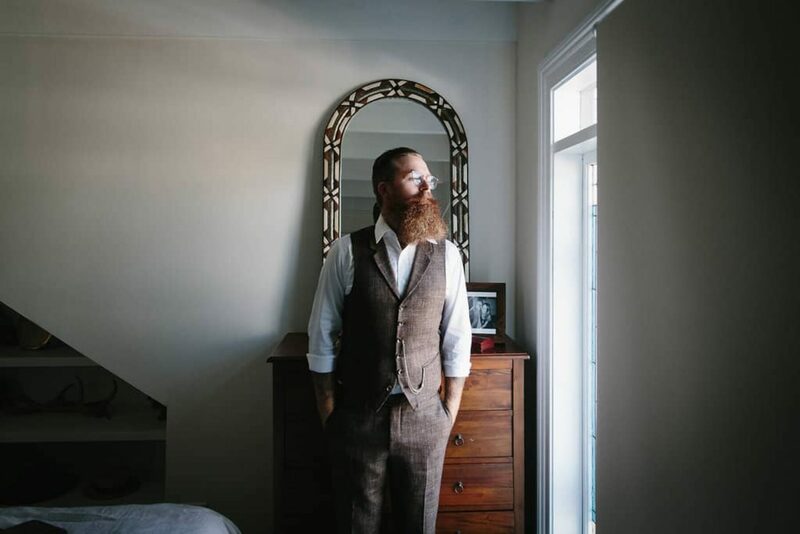 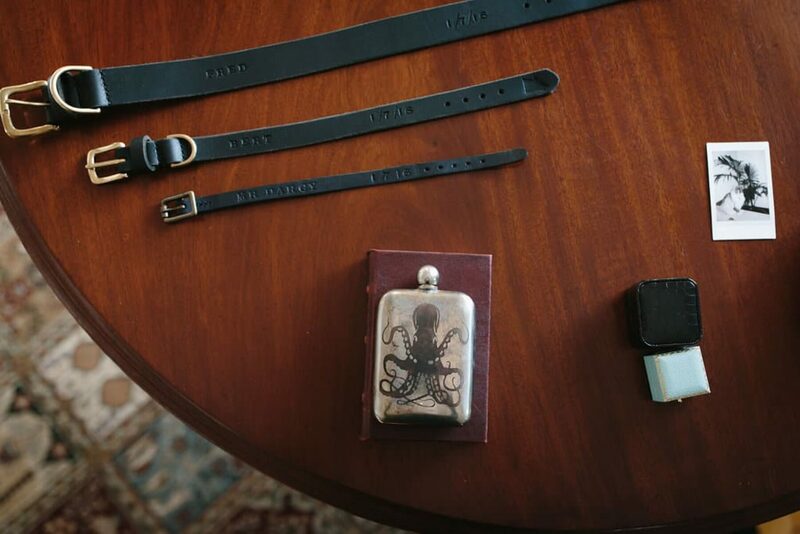 Williams finished the look.